GenCon is coming up in a few short weeks, and at the convention (Friday, August 16 at 8 p.m. in the Union Station Grand Hall to be exact) is the Annual ENnies Award ceremony. Voting is open starting today and ending on the 31st. You can see the nominees here and vote here. 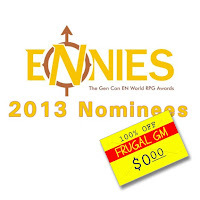 The ENnies are a good deal for Frugal GMs for a couple of reasons. One good reason to be interested in the ENnies is simply the fact that this is a fan-driven award so those items that have been nominated and especially those that win should be somewhat vetted, meaning that they are at least worth a look-see. 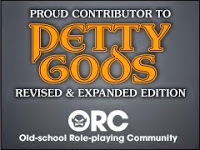 The second reason, and the underlying purpose of today post, is that the ENnies have an entire category devoted to free RPG products. There is also a category for "Best Podcast" and "Best Blog" I've yet to pay for a podcast or blog, so presumably there are some free goodies there as well. You should check out the free products before voting...after all, you do want to be an informed voter, right? I find it difficult to believe that any GM couldn't find some good ideas from one of these free products. Please check them out and vote for your favorite before the end of the month.